Around 36 years ago, in 1979, the telephone company AT&T rolled out what became one of the more successful advertising campaigns in history. To pitch its long-distance service, the slogan was "Reach Out and Touch Someone." In an era when we take unlimited minutes and free long distance for granted, it's hard to imagine how powerful it was for loved ones, separated by great distances, to hear the sound of a beloved's voice. Even if a telephone wire could not physically bring two people together, they could nonetheless "reach out" metaphorically to touch another by picking up the phone. While the slogan may have been both innovative and profitable, the impulse behind our desire to "reach out and touch someone" is hardly new. 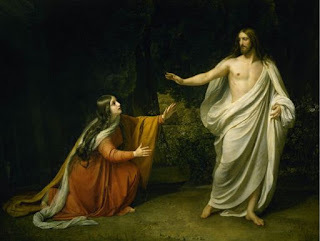 Indeed, today the Church remembers Saint Mary Magdalene who, in today's Gospel, is the first to discover the Empty Tomb and to encounter the Risen Christ. In the midst of her grief, Jesus' address to her unleashes a whole new era of history: He is the one who has cast off the shackles of death and returns not as one seeking vengeance but as offering peace. Quite naturally, Mary reaches out to seize the one for whom she has been grieving. This is, of course, a most wonderfully human response: it's hard not to pick up and cuddle babies, to hug loved ones after a long absence, to embrace another as a sign of giving and needing support. She seeks to take hold of, to grasp, Jesus. He who was seemingly lost, crushed by the machinery of state violence and torture, has been found. It always strikes me that Jesus rebuffs this gesture. "Stop holding on to me," he says, "for I have not yet ascended to the Father." Thus a space emerges between them, a gap between Mary's grasp and the one she loves. She has encountered the Risen Christ and come to know him as entering into the midst of her sorrow and grief. Yet she cannot gather him to herself, for though he is now known he cannot be owned by human embrace. I would like to suggest that today we pause to consider Mary Magdalene as one of our foremothers in Christian faith. For Mary's recognition of her Beloved in the garden is itself the gift of faith, a response to One who reveals himself to those who desire to see. As a model, Mary's faith is not something she possesses but, rather, someone by whom she is suddenly possessed: Jesus irrupts into her grief and invites her along into a new era of history. Because faith is a gift and not a human achievement, a gap always remains between the One who is revealed and those to whom God is revealed. No word, phrase, or formula can ever sufficiently bridge this abyss between the Holy One and ourselves. To be sure, some statements of belief are better and more adequate than others, but none can ever exhaust the Mystery of the Risen Jesus. Like a person utterly shocked at a surprise birthday party, we stutter and splutter words of gratitude, but none of these words will ever express sufficiently the joy in our hearts. A faith worthy of belief is one capable of recognizing that, for as much as we desire to reach out and touch Jesus, we cannot ever constrain or control him. We cannot pin him down or imprison him in our human systems. He is always on the way to the Father and he sends us out to gather others to follow along. Hence our fundamental need for the Church: each time we say "Yes" to grace and embark upon the journey of faith, we take our place within a great host of women and men who have struggled and strained to walk with the One who is the Way, the Truth, and the Life. If at times our beliefs appear no more than rickety boards barely suspended over a yawning chasm, they are the boards that those before us have used to come closer to the Lord. The Church is not a surrogate for faith, a taxi-cab delivering us rapidly to our destination. Instead, the Church is both context and conveyer of faith: we come to know Jesus Christ within the Church and, in the company of other pilgrims, dare to take our place among a history of believers who have set out on the journey of faith. A faith worthy of belief is not one that has all the answers but, rather, one that leads us into the joyful exploration of a Mystery that reaches out and grasps us, ignites our hearts, and brings us as a pilgrim people who grow deeper and more faithful as the Body of Christ.